Quick, fresh & crowd pleasing! 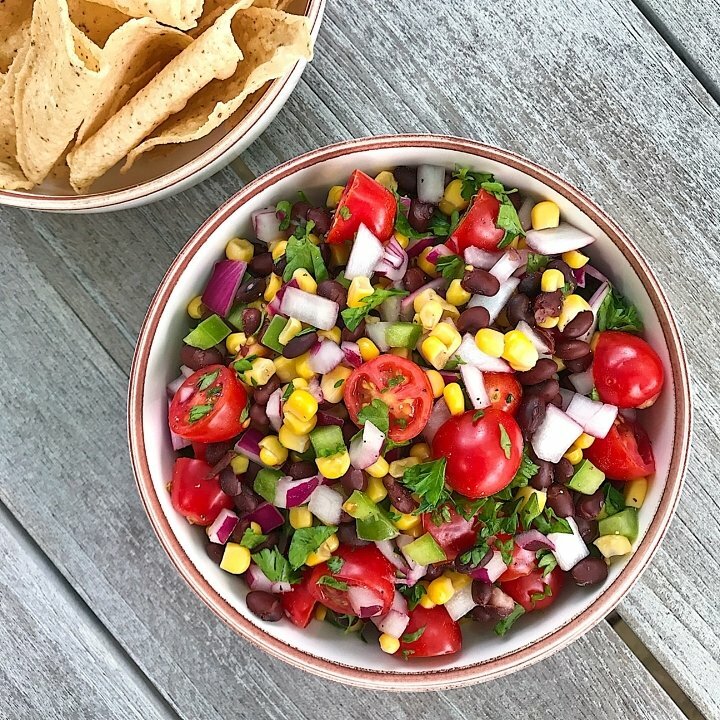 We live on this Black Bean Veggie Salsa all summer long… great for backyard barbecues, impromptu get togethers, feeding a hungry crew before dinner or simply meal prep! Super quick and easy to assemble, it’s fresh, light and a total crowd pleaser. 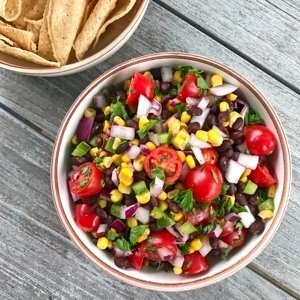 It is simply Black Beans, Corn, Green Pepper, Red Onion, Tomatoes and Fresh Parsley all mixed together and seasoned with Rice Wine Vinegar, salt and pepper. Served with your favorite gluten-free corn chips– we love these Siete Foods Lime Tortilla Chips– the saltiness of the chips perfectly balances the fresh and tangy salsa. So go ahead an make a batch. Serve with chips, add to a salad with avocado or add in some quinoa and turn it into our favorite Black Bean Veggie Quinoa Salad. Our go-to Black Bean Veggie Dip is perfect all summer long... it's fresh, light and a total crowd pleaser. Super quick and easy to assemble, it's great for backyard barbecues, impromptu get togethers or feeding a hungry crew before dinner. Serve with chips or add in quinoa and turn it into our favorite Black Bean Veggie Quinoa Salad. Serve with your favorite gluten-free corn chips.